British authorities have absolutely ensured that 23-month-old Alfie Evan of Liverpool is dead. Catching the world’s attention, the British courts ruled against his parents, Kate James, 20, and Tom Evans, 21, who required legal permission for their son to leave the UK to receive medical treatment at the Vatican’s dell’Ospedale Pediatrico Bambino Gesù (Baby Jesus Children’s Hospital), the same hospital visited by Melania Trump on a recent European visit by she and the president. At the end of 2016, Alfie started having seizures, and since then he has been cared for by Alder Hey hospital. He is suffering from an undiagnosed brain condition. In a court judgment in February this year, Mr Justice Hayden referred to the opinions of doctors not only from Alder Hey, but also from two separate experts at Great Ormond Street, from two Munich hospitals, and from the senior clinical team at Bambino Gesù itself. “All agreed,” Mr Justice Hayden wrote, that the “degeneration” of Alfie’s brain “is both catastrophic and untreatable”. Last Friday, the Supreme Court rejected Alfie’s parents’ appeal for further treatment, saying: “The unanimous opinion of the doctors who have examined him and the scans of his brain is that almost all of his brain has been destroyed.” No recovery is possible, according to the doctors. Mr. Justice (Sir Anthony Paul) Hayden ruled that the decision had to be taken out of the parents’ hands – because of the risk that Alfie is in pain (though the judge agreed with the doctors that this was “unlikely”) and for the sake of Alfie’s “future dignity” and “autonomy”. Alfie could have been one of those children at Bambino Gesù. Alfie was taken off his ventilator and managed to survive for five days. However, Alfie’s father, Tom, and his parents are Catholic, and in an audience with Pope Francis they have found an ally. The pontiff gave the family not only his prayers and support, but also guaranteed Alfie a spot at the Vatican’s children’s hospital to treat his still undiagnosed illness. As it turns out, not only did Pope Francis come to Alfie’s defense, so did the Italian Foreign Minister Angelino Alfano, Interior Minister Marco Minniti, former Polish Prime Minister Beata Szydło, and Polish President Andrzej Duda. Alfie Evans must be saved! His brave little body has proved again that the miracle of life can be stronger than death. Perhaps all that’s needed is some good will on the part of decision makers. Alfie, we pray for you and your recovery! Marines have a soft-spot for kids and dogs. Possibly best exemplifying such would be the examples set by the Secretary of State Gen. James “Chaos” Mattis, USMC (Retired), and the Chairman of the Joint Chiefs of Staff Gen. Joseph “Fighting Joe” Dunford, USMC. The duo greeted North Carolinian Cooper Smith, 16, to the Pentagon, making his wish come true to visit the headquarters of the American armed forces. His admiration for the military comes from his recognition of the service and sacrifice of the nation’s men and women in uniform, he said. He volunteers at several organizations in North Carolina, including the Ronald McDonald House and Brenner’s Children’s Hospital, and he initiated a project that secures used books, toys, and games for a school in near Winston-Salem, North Carolina, with a high percentage of students from low-income families. He donated bags of books and games to begin the initiative, and so far, the project has accumulated several truckloads of donations to help the school. Marine Corps Gen. Joe Dunford, chairman of the Joint Chiefs of Staff, hands a signed hat to Cooper Smith during an official visit coordinated through the Make-A-Wish Foundation at the Pentagon, April 2, 2018. DoD photo. Did the South American Socialist honestly deny the existance of Hell? Presider-in-Chief Bergoglio is at it again. His rather schizophrenic brand of eschatology is again sowing confusion and dissent among the Faithful. As everyone by now knows, he supposedly has denied the very existence of Hell. In all fairness, when I first heard this I just blew it off as just another anti-Catholic rant. Upon looking a bit deeper into the accusation, come to find out that this was published by Eugenio Scalfari, the 93 year old professional atheist of La Repubblica, Italy’s communist-friendly newspaper. 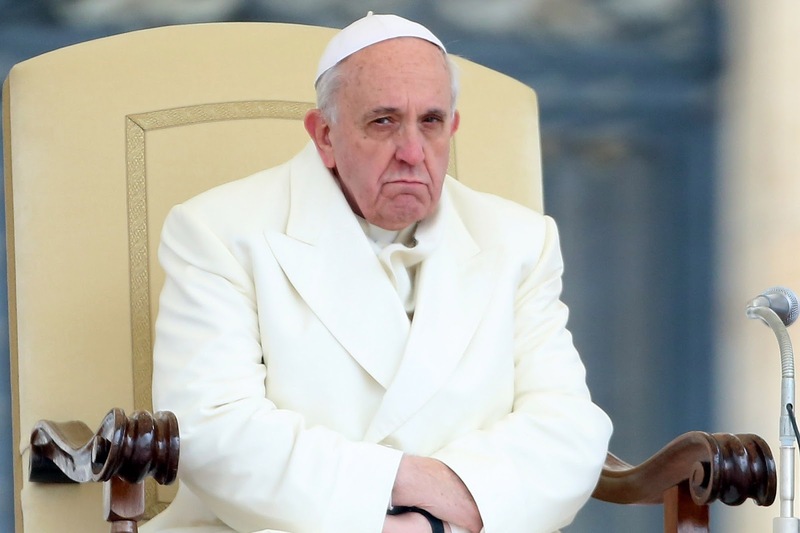 Now I’m never one to take the word of a watered-down communist, but the official Vatican response came up as being, as usual for Bergoglio, it was confusing and more than capable of sowing dissent. I have a novel idea… how about just a flat-out denial that he didn’t just piss all over 2,000 years Catholic teaching? I’m writing this in the most fair and objective way possible. The only conclusion I can come up with is that this man is playing with literal fire.